Every violin has the potential to play the classics. 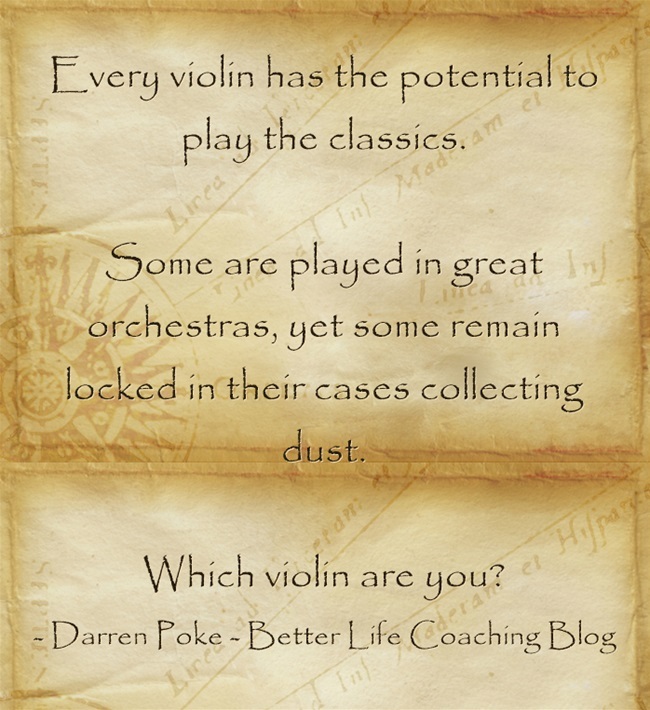 Some are played in great orchestras, yet some remain locked in their cases collecting dust. Every paint brush has the potential to paint a masterpiece. Some are used by great artists, yet some stay on the shelf and are never used. Every running shoe has the potential to run a marathon. Some are worn down from beating the pavement for mile after mile, yet some are used for nothing more than a casual saunter. Every Star Wars figure has the potential to bring delight to a child. Some are used in epic imaginary battles and quests, yet some remain forever in their original wrapping in the cupboard of a grown up. Every person has the potential to do something remarkable with their lives. Some use their unique skills to make the world a better place, yet some waste their opportunity or forever underestimate their potential.